Like most people, on hearing of the death of Osama Bin Laden last night I felt curiously lighter. I wasn't gloating at the news, it was something else - it felt like a spell the city had been laboring under had finally been broken. Outside my New York window last night I heard fire trucks blaring their horns in celebration. I don't begrudge them their feelings, but I don't know if it's a time to celebrate. I understand the impulse though, God knows I do. If you were in New York City on 9/11 2001 you'll vividly remember how beautiful the weather was that morning. It was a day of particular splendor, creating an unforgettable disconnect between the smoking rubble and the deep blue sky. In a daze after the attacks, accompanied by many others, I had walked all the way to the Cloisters in Upper Manhattan by late afternoon. I found I couldn't stay indoors looking at those planes crashing on a loop on the breaking news reports. So instead I walked and kept walking in search of some place soothing and shaded. They have a flower garden in the Cloisters grounds and soon I was watching bees floating from petal to petal in the late afternoon sunlight. The park benches were shaded by towering trees. We sat there for a long time. The silence was interrupted every few minutes by the roar of low flying military fighter jets and speeding helicopters. I found I couldn't speak, or rather I didn't want to. Earlier I had lost contact with my partner for five hours as walked home. I embraced him when he reached my door. In the days that followed Missing Persons posters starting going up all over town. They were decorated with flags, ribbons and little mementos, and they had already begun to look like memorials in fact. Soon we were hearing of hundreds killed; then thousands. 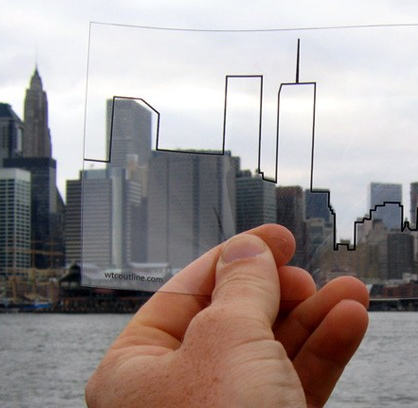 The images of those twin towers falling are one of the most infamous acts of mass murder the world has ever seen. You don't get over a day like that, you just carry it with you. Last night, when I heard that the man responsible for that atrocity Osama BinLaden was dead, I remembered two contrasting things simultaneously: the beauty of that day and the horror he unleashed on it. He was death in life. He was a fanatic and a bully. He was yet another one of histories despots who thought he could reshape the world through mass slaughter. I don't know where such men come from, or why there are so many of them, or why in their tragic madness they imagine they'll succeed where every other tyrant with a grudge has failed. Bin Laden lived by the gun and died by it. How could he have imagined it would end another way?